Scotland’s North Coast 500 is a 500-mile (800 km) route that takes you all the way round the coast of Scotland north of Inverness, visiting some of the most beautiful and dramatic scenery in the world. You can travel in a clockwise or anti-clockwise direction – or do it both ways on different trips. The official route takes you clockwise, but many people say the views are better going anti-clockwise. 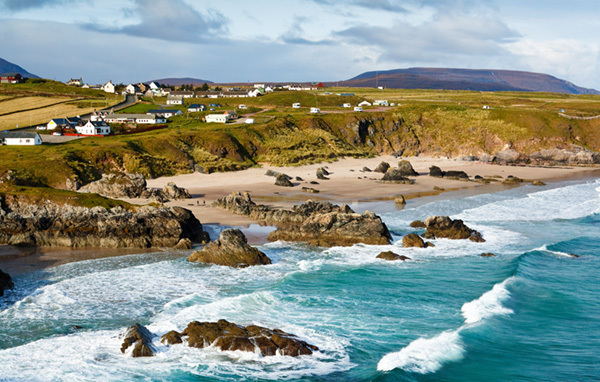 Can you travel the North Coast 500 by motorhome? The official advice on the North Coast 500 website is “For the most part, the route is completely suitable and many before have completed the route in a motor home. The ‘Bealach Na Ba’ stretch [from just north of Ardarroch to Applecross, on the west coast] however, is not suitable for large motorhomes, caravans and inexperienced drivers due to its sharp bends and steep gradients so we would advise going up the A896 instead which will be much safer for you and your passengers. The NC500 website also has an interactive map, which shows useful things like places to eat, accommodation (including caravan and camping sites), attractions, petrol stations and outdoor activities; and an app you can download to your Android or i-phone. What are the highlights of the North Coast 500? Most of the suggested routes cover the whole North Coast 500 route in 5 days, but for a motorhome tour that will be quite tiring. If you’re looking for a great holiday rather than a mad dash, it’s worth taking two weeks to do the full circuit if you can – there’s so much to see and do! If you’re feeling adventurous you can take a walk to the Rogie Falls on the Black River, go scuba diving at Lochcarron, canoeing on Loch Ewe, or take a whale-watching or glass-bottomed-boat cruise from Gairloch, climb mountains such as Suilven, take a boat tour of Britain’s largest sea cave, Smoo Cave near Durness, go mountain biking at Golspie, or visit the Tollie Red Kites bird sanctuary near Dingwall. There are numerous opportunities to take to the hills for a longer hike, and of course, there are beautiful beaches to explore all round the route. If you enjoy golf, there are courses at Invergordon, Tain (also home of Glenmorangie Whisky, which is open to the public and worth a visit), Dornoch, Golspie, Reay (the most northerly golf course on the British mainland) and Durness, so there’s no need to leave your clubs at home. 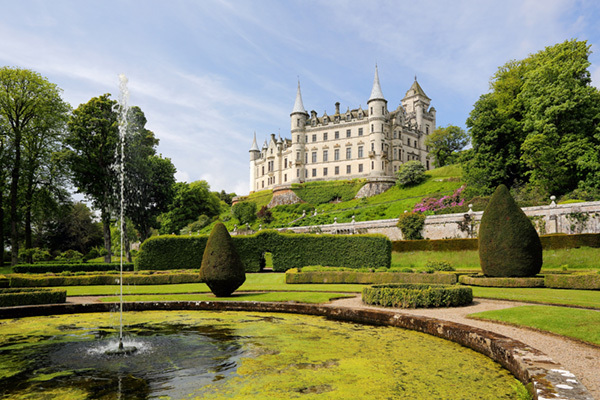 If you’re looking for a more cultural tour, you can visit the world-famous sub-tropical Inverewe Gardens, Dunrobin Castle at Golspie, the late Queen Mother’s Castle of Mey near John o’ Groats, the Strathnaver Museum at Bettyhill, the Highland Museum of Childhood at Strathpeffer, the Ullapool Museum, housed in a church designed by Thomas Telford, the ruins of Ardvreck Castle on Loch Assynt – the list goes on. Photographers will find stunning views round every corner. Lovers of good food and drink will find delicious local produce and sea-food in the many hotels and pubs all round the North Coast 500 route. Geologists will be fascinated by Knockan Crag, site of the Moine Thrust where the older, darker Moine schists have been pushed over the lighter, darker Durness limestone, a view of the Duncansby stacks near John o’ Groats, a visit to the Assynt Visitor Centre, which has displays of local geology as well as of local wildlife and flora – and, indeed, the many mountains and rock formations all round the route. You can plan your itinerary around your own interests, and the NorthCoast 500 website offers an introductory set of itineraries. In fact, wherever you go on Scotland’s North Coast 500 route you’re sure to find something to interest or wow you. Why not make it your destination for your motorhome holiday this year? Get to know the areas and communities that make up the Highlands, where you'll find the most distinctive Scottish culture in the UK. Art, locally-crafted jewellery and stoneware, the music of our pipe bands, and the exuberance of the Highland Games! Northern Scotland has some of the most untouched land in Scotland, so you'll find an abundance of ancient Pictish trails, castles, villages, and folklore. Ready to Book Your Motorhome Adventure on the North Coast 500? Please fill out the form below & we'll get back to you as soon as possible.